Here in the Old City of Jerusalem and probably in your own neighborhood, classes for the coming holidays are popping up everywhere. As the intensity of Elul is building, the talk of the town is tshuva, repentance. We Jews spend an entire month working on ourselves, fixing bad habits and making amends with those whom we might have hurt– all in preparation for the fast approaching Day of Judgment. But before we get to that awesome day, we celebrate the New Year. Rosh Hashanna is also an awesome day, replete with a half days in synagogue and several festive meals to prepare. In the midst of our preoccupation with tshuva, we cannot help but be distracted by menus and recipes for all these yom tov meals. The main work of Rosh Hashanna is to crown Hashem our King. And since we, His people are also royalty, our meals should reflect this. But after a long day of services, the meal has to be simple as well as elegant. Make ahead dishes that reheat easily like the Ginger Pumpkin Souffle below or crunchy salads which can be prepared ahead and served cold are what I look for. We go for sweet foods to symbolize our desire for a sweet new year and the meal of course begins with the simanim. There is a well observed custom to eat certain foods on Rosh Hashanah accompanied by requests to Hashem. We ask Him to save us, increase us, consume and destroy our enemies and give us a sweet new year. The most recognized example of this is, of course, the dipping of apple in honey and asking that our new year be as sweet as the flavors of the succulent apple mingled with delicious honey. Clearly there is something else going on here. While there are all sorts of foods we eat either by command or by tradition on other holidays, nowhere else is a customary food associated with a formulaic device such as this. And why don’t we just come out and ask G-d for our needs? Why are specific foods necessary to punctuate our request? The practice is based on a Gemara and there is definitely something of import going on. In fact, the Sefas Emes cautions us not to take this custom lightly. He says that we should not simply recite the request, rather, we should implore Him with all of our hearts. Our heartfelt plea may arouse His mercy; it should also make us more aware of how vulnerable we are and how much we depend upon Hashem’s benevolence. We know that it is our overriding task on Rosh Hashanah to enthrone Hashem. On inauguration day, we do not bother the King with our daily worries. But it is perfectly acceptable, even praiseworthy, to give a sign, a siman, that we depend on our Him for everything. By making these requests in the form of a hint, we relegate our needs to a place of lesser importance. We state our awareness that Crowning Hashem King is what fills up the day. Traditionally we eat these vegetables because their names sound like, and therefore hint to, the good we hope Hashem will bring in the new year. May our enemies be cut off! May our adversaries be removed! May our adversaries be consumed! May our sentences be torn and our merits proclaimed! 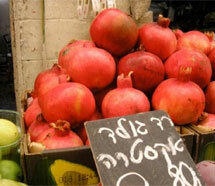 Pomegranate, because of its many seeds. May we be like the head and not like the tail! May our children always live honestly! May Hashem provide for us a raise in salary!